Jual Lutron AM-4204 Hot Wire-Anemometer di Jakarta Selatan. Jual Lutron AM-4204 Hot Wire-Anemometer call : +6281283804273, wa : +6281932632003, Lutron anemometer dengan harga murah dari toko online Darmatek di jakarta selatan. 0.2 - 20.0 m/ s, high precision for low air velocity measurement, Telescope probe.m/ s, ft/ min, km/ h, knots, mile/ h, oC/ oF.Max., Min., Data hold, RS-232. 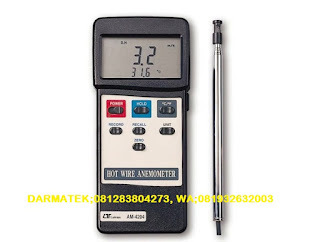 - Combination of hot wire and standard thermistor, deliver rapid andprecise measurements even at low air velocity value. - Microprocessor circuit, m/ s, km/ h, ft/ min, knots. mile/ h.
- Heavy duty & compact housing case. - Auto shut off saves battery life. - RS 232 PC serial interface. 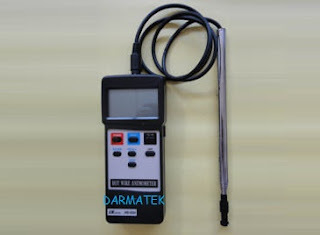 - Thermistor sensor for Temperature measurement, fast response time. - Applications : Environmental testing, Air conveyors, Flow hoods, Clean rooms, Air velocity, Air balancing, Fans/ motors/ blowers, Furnace velocity, Refrigerated case, Paint spray booths.